Born on 9-3-1908. She was born in Ellisville, MS. She is accomplished in the area of Community. Mamie Kirkland is a super centenarian, and at the age 110 years is Buffalo's oldest citizen. 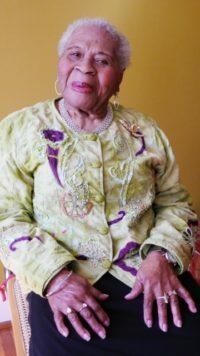 Mrs. Kirkland was born on September 3, 1908 in Ellisville, Mississippi. She moved to Buffalo, New York when she was 15 and has lived in this city for 95 years. Her family was forced to flee their home in Ellisville when her father was threatened to be lynched. The family moved to East St. Louis in 1915 only to experience the horrific riots in that city in 1917. The family moved next to Alliance, Ohio where they were threatened by the Ku Klux Klan who burned a cross on their lawn. Mrs. Kirkland met and married her late husband, Albert Kirkland when she was 15 years old. The couple relocated to Buffalo, New York in 1924. The couple were married for 35 years, until Mr. Kirkland's death, and had nine children. One of Mrs. Kirkland's children is Dr. Juanita K. Hunter, who is also an Uncrowned Queen. After her husband's death, Mrs. Kirkland found work as an Avon representative. Through her entrepreneurial efforts she helped to support her family and developed her own brand of community ministry. At the age of 107 Mrs. Kirkland was encouraged by her son to return to Mississippi. The story of her family's flight from the state is the subject of a New York Times article and a documentary film, 100 Years From Mississippi, that her son, Tarabu Betserai Kirkland is directing and producing. Mr. Kirkland has established a website that provides information about this film in tribute to his mother's story: www.100yearsfrommississippi.com . In 2018, Mrs. Kirkland was invited, as a guest of the Equal Justice Initiative, to attend the opening of the National Legacy Museum: From Slavery to Mass Incarceration and the Peace and Justice Memorial in Montgomery, Alabama. Mrs. Kirkland's story is one of five featured digital stories that are on permanent display in the Museum. Mrs. Kirkland was honored at the opening ceremony and presented with a Champion of Justice medallion as the oldest lynching survivor the Equal Justice Initiative has researched in their exhaustive study, Lynching in America: https://lynchinginamerica.eji.org/listen/tarabu-kirkland.